If you have ever been on a Carnival Cruise you may have certainly had one of their premier deserts. The Warm Chocolate Melting Cake is a thing of legend aboard every Carnival vessel. Most people tell me they eat at least 1 per day. Even you have not been on a cruise before you must have heard plenty of story's about this desert. There are entire blogs and message boards devoted to this sinfully delicious desert!! Thanks to our friends at Cruise Critic and the nice people of Carnival...they have divulged the secret recipe in a smaller version. For years Carnival would only give out this recipe in a portion to feed 3,000 people. After some secret handshakes and info sharing with one of Carnival's top chefs, Cruise Critic got the recipe broke down into a normal size version for you to make at home. Pour the mix in a greased mould. Large outside deck (mostly covered). And of course all of the UCF memorabilia and some decent food to grub on as well. The wife and I have been to the moat a few different times and we recently went with a group of friends to introduce them to the moat as well. Having ate there on 3 occasions and sampling the menu extensively..I thought I would share my thoughts on this establishment. When you walk in you are instantly greeted in a foyer with a fine collection of UCF memorabilia. From trophy's and plaques..to signed pictures from the players and coaches of present and past UCF sports teams. Even if you are not a UCF fan, you can admire the memorabilia and the overall design theme of the restaurant. Its done in a very taste full and well laid out manor. The Moat is a true Sports Bar...with 2 main bars and a patio outback. They have over 16 brews on tap always, plus an extensive collection of bottled beer and wine..and I'm sure the bartender can make you any concoction you may delight in. A hit with all the college kids is what is known as the tower..its 80 giant ounces served in a large tower with a drought spicket on the bottom!! During the school year and especially during UCF Football and Basketball seasons the place is usually packed and can have a lively atmosphere most nights. During the off seasons and summer time the restaurant is tame and quiet. We recently went on a Saturday around 7:00 pm and it was pretty quiet inside. The menu at The Moat consists mostly of sandwiches, burgers, salads, appetizers and a few offerings for a main dish type of meal. So far from my experience the food is really hit and miss...there is a lot to enjoy on the menu...but there are some things I would caution you about. Chips and Queso---MISS---The chips are like unflavored yellow Doritos, and the queso had a weird almost unflavored taste to it...don't know what else to say except..Avoid!! Southwest chicken: Grilled chicken, Monterrey jack, red onion and drizzled with chipotle sauce. All of the flat bread offerings are done very well and the bread is baked to a perfect crispness yet soft where it needs to be. The pulled pork is my favorite...and that's because of the pulled pork they make in house and its good on everything. Wings---MISS The wings come in a variety of sauces.. like Mild, Medium, Hot, Dragons Breath, Parmesan Garlic, BBQ, Teriyaki or The Moats very own Black & Gold wing sauce. We had the hot wings with some garlic added to them. The wings themselves are a tad small for a restaurant and just did not come off very well. Its not that the wings were awful...I just expected a sports bar to have really superb wings. Instead they have sub par wings. I think the Management at The Moat should work on this a little more. Fresh tortilla chips layered with lettuce, tomatoes, onions, jalapeno peppers, cheddar, and Monterrey Jack cheeses then smothered with our homemade pulled pork and drizzled with BBQ sauce. You must order this---its fantastic. Again the winner here is The Moats very own home made slow cooked pulled pork---There is so much flavor in every bite and its all delicious. 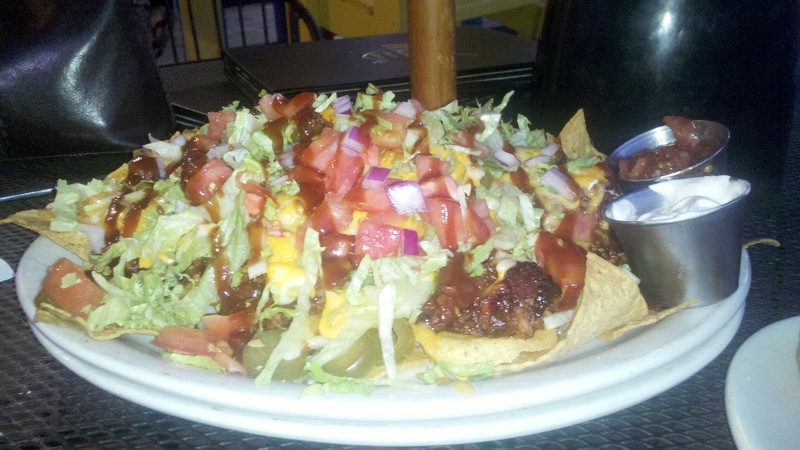 There is more than enough here to share with others as it comes a jumbo plate-- and you cant beat a price tag of $8.99. This is my personal favorite dish here--its technically an appetizer but I would eat this for dinner...and why not its got all the food groups a well rounded meal should have---Veggies, Cheese, Pulled Pork,,,and Pulled Pork..and..OK-Its good! Reuben Won Tons---HIT A Reuben won ton is twist on a traditional won ton. It is a won ton stuffed with corned beef, sauerkraut, Swiss cheese, and fried golden brown. Served with 1000 Island for dipping. If you like Reuben's...and for that matter won tons---this is a mach made in food heaven. Delicious corned beef and sauerkraut fried to perfection. The Reuben---HIT The Reuben is not far from the tree as the Reuben won ton--same quality ingredients just slapped between 3 delicious pieces of a marble swirl rye bread----Simple and good! Beef Tenderloin Sandwich---MISS The menu claims that this is their most tender cut of beef marinated in olive oil and garlic, seared and served on a Ciabatta roll. While the beef was in fact tender...it lacked any real flavor. Whats worse is that the sandwich came on a good Ciabatta roll with a slice of a tomato and a piece of lettuce---and thats it! A bland slab of beef with no mayo or cheese or nothing...I felt kind of cheated with this selection and only ate half of my sandwich. The only thing good here was the french fries. All sandwiches and sliders come with seasoned fries. Pulled Pork Sliders---HIT Well as you can guess, a theme is occurring here......anything with the pulled pork is really good. Just be aware though! !---These are not traditional sliders. You get 3 large rolls stuffed with pork--it measures altogether as long as a foot long sub. So be ready to eat or share!! At this point if they served pulled pork on saltine crackers I would give it an excellent review!! Cajun Chicken Club---MISS This is a traditional Cajun grilled chicken breast, topped with bacon, lettuce, tomato and bistro sauce. However..once again the sandwich lacked any real flavor and there was barely any Cajun seasoning on it all. At the end of the day the Moat is a fun place to go with friends or family and have a good time....even if you are not a UCF fan or student or Alumni. The food is for the most part good. and the service was very attentive on all occasions. The menu is very reasonably priced as well. If they would revamp the wings a little and add some much needed flavor and seasoning to some of their dishes this place would be a top notch eatery..not just a really good sports bar and grill. Maybe when you visit The Moat you will have to experiment a little on your own with the menu, after all that's fun of trying something new. As you can imagine if I can recommend anything to you I will recommend anything with the pulled pork on it!! I would definitely recommend you and your friends hanging out at "THE MOAT"
Tibby's is the brainchild of the same people who brought you Tijuana Flats. So when you walk into the restaurant it has a feel of Tijuana Flats in a sense. There are bright paintings of Mardi Gras dancers, lively people and musicians as well as actual pictures of New Orleans and the streets which make it famous. All of this is accompanied with lively jazz music playing in the background that one might expect to hear in the French Quarter. There’s even a large door hanging on the wall that is an actual piece from Hurricane Katrina complete with spray paint from a search team. Tibby lived to be 93. He was an uncle who would share his stories & share his love. We created this place in his honor"
The main difference aside from the food and overall atmosphere here and at Tijuana Flats is that this is not a "Walk Up and Order" type of place...Tibby's is a "Wait to be Seated" style establishment where you are waited on. We decided to kick off our New Orleans experience the right way with Craw Fish Remoulade...and it was quite tasty indeed!! Tibby's craw fish remoulade is simple lightly fried craw fish served over a bed of lettuce & topped with a darn good remoulade sauce served in a large Schooner glass with forks. We decided to wash our food down with some of the craft beers they have on tap. The first beer was similar to an Amberbach or an Irish Red...a dark brew with a carmel and slightly nutty flavor..It was very good. The second brew we tried was the Raspberry Ale...wooo..Pucker UP sweetie...its good..but the Raspberry is very strong in this one. What makes all the beers extra good is the fact that they come in what is called a "Schooner" type of glass. Its basically a really big goblet, but the Schooners are frozen before serving so as to keep your brew extra cold!! On to the main course..
First I had the...let me spell it out for you....A (MUF-FU-LE T-TA) The Muffuletta is a traditional style New Orleans sandwich much like the Po'Boy is. It is made from Genoa salami, hard salami, sweet ham, provolone & mozzarella cheeses topped with Gambino’s olive salad & served on true New Orleans bread. Having never had one before it may seem a little harsh...but this was NOT a good sandwich. It was super duper salty. You can order it by the half or by the whole..and I was glad I ordered the half. I don't know if this sandwich is supposed be salty or not..So I can't honestly tell you what to think about it. But it was way too salty for my tastes. I even tried removing some of the ham....not much help!! I decided to try a side of the New Orleans Potato Salad Mixture just because I was curious form reading the menu. It consists of potatoes, eggs, bacon, sausage, olives, pickles & onions.---That sounds very interesting..so I could not resist, and I must say it was well worth the adventure. It sounds a little weird....especially if you are used to a southern style of potato salad, but all the ingredients work out very well for a great taste and texture to boot!! ﻿﻿﻿﻿﻿﻿﻿﻿My wife went with the Shrimp & Andouille Cheddar Grits. For $13.00 you get some succulent sautéed shrimp, andouille sausage & sweet onions over cheese grits and they finish it off with a red wine gravy. If that was all it was that would be fine with me...but wait theres more...It comes with some good old Cajun andouille sausage and then the whole dish is drizzled with a delicious red wine gravy sauce. Man was that good. The dish is however very rich in flavor and very filling. After eating about half of the bowl my wife had to call it quits. Grits by themselves can be quite filling. I would recommend this dish to anybody and would order it my self! Finally.....YOU CAN NOT GO TO TIBBY'S AND NOT TRY THE BEIGNETS!! Beignets are the official state doughnut of Louisiana. It is a little square pocket type of pastry that is deep fried & loaded with powdered sugar. A single serving (three per order) for $2.75 is enough for 2...especially after eating such rich meals, but if you insist you can order them family style which is seven per order for $5.00. As you can imagine---FRIED--PASTRY DOUGH--SUGAR---enough said... and these things melt in your mouth!!! All in all we definitely return to Tibby's. Maybe next time I will go for a Po'boy of some sort and my wife will try the Chicken Pontchartrain. There is something for everyone at Tibby's even if you dont like crawfish. From salads to sandwiches..from wings to seafood...you are sure to find something you will like.